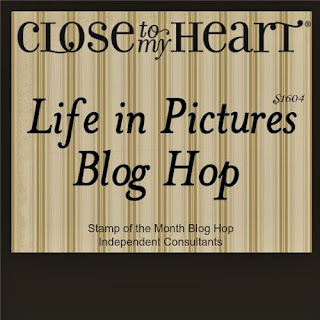 With almost 30 participants in this blog hop, you are sure to find lots of wonderful ideas on using Close To My Heart's April Stamp of the Month. The hop makes a circle, so if you are starting here just continue until you make your way back and you will have made it through them all. If you have already started and are coming from Donna Digby's blog, "Dat's My Style", then you are on the right track. I love this month's stamp set! There's just something about vintage cameras. I had planned on making a card, but this week I went to Disney with my nieces. It was my first time meeting them and their first time at Disney. It was the best day ever! I then found this layout saved on one of my Pinterest boards and knew that I wanted to do a take on it. I still need to print the photos, but I'll included it below when...and if...I get permission from my sister-in-law to post it here (so you can see how cute they are). 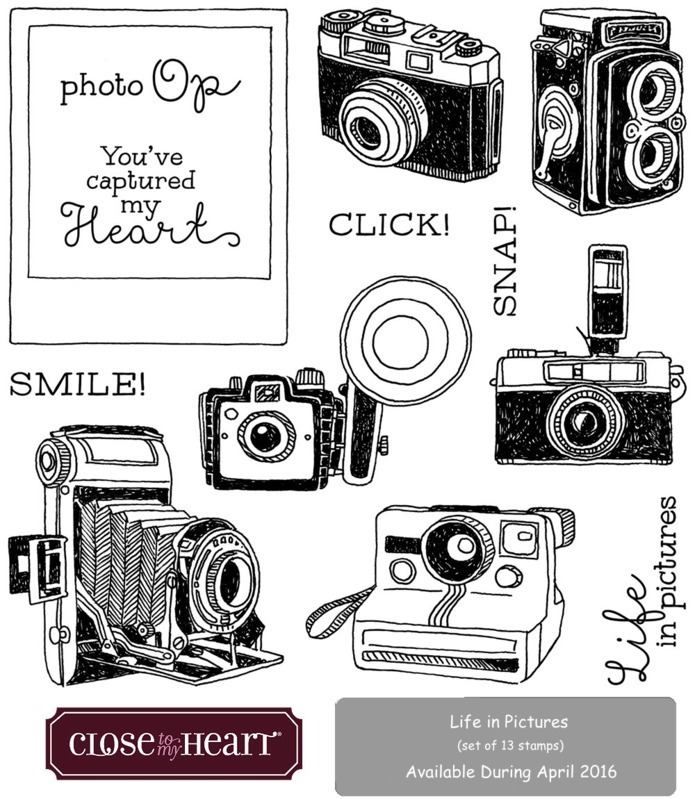 :) I went ahead and stamped the "You've captured my Heart" in two places, but will probably change that when I go to put the photo on. Probably with some journaling. I still feel like something's missing (besides the photo), but otherwise, I like how it turned out. If you have time, take a moment or two to check out the rest of my blog. 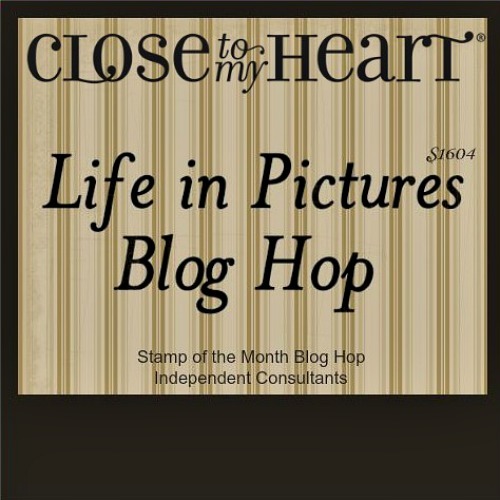 If you enjoy your visit, then please consider "Following Me", signing up to receive blog updates, and/or leaving a comment (we all love comments...the nice ones anyway), then be sure to continue along on the hop by heading over to my fellow consultant, Kathy Burrow's blog, "Snips, Snaps, and Scraps" and check out her project. I LOVE your layout! 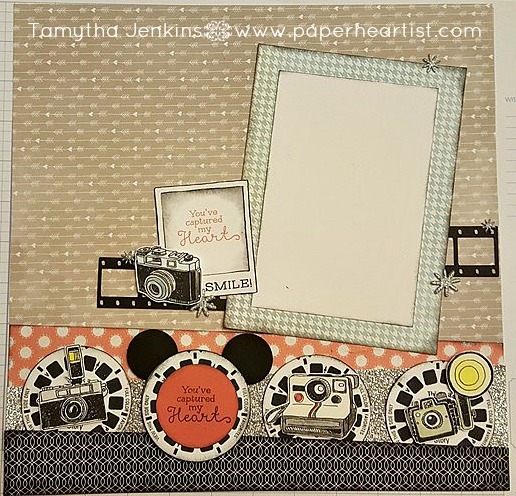 Great layering of all the stamped images and I love how you mixed all the different paper lines. Great layout! I especially like the bottom layered border. Great job combining stamps to create a super fun layout! Great mix of papers! Love the layout! What a fun layout! Love it! Really love the Zoe paired with this layout, and such a cool border you have created! Awesome layout! I love all the detailed layers.